The military communication market can be broadly classified as Land/ Troop Communication, Navy and Airforce. Land Communication refers to all communication systems on combat vehicles, which are personal vehicle carriers and MBT to name a few. Troop communication systems includes the soldier mounted radio systems. The solider mounted radio are being replaced with the mobile telephony systems and SATCOM, due to the higher reliability of the systems. 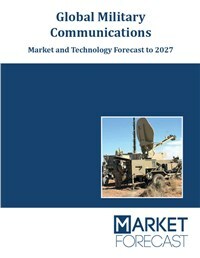 Current Technologies in Global Military Communications Market: This sections covers the current technologies used in the Radio, SATCOM, Radar and the different types of tactical data links and their key differences. Current Market Overview: In this section the current defense infrastructure of the US and UK defense forces are dealt in detailed. This section also covers the upcoming technologies in the areas of Hardware, SATCOM, Networks, Sensors, IoT and Cloud Computing. Market Segmentation: The report has been segmented as equipment wise, region wise, platform wise and sub system wise. The market forecast chapter uses these segmentations to understand the future market potential of this market. Market Analysis: This section deals with the key drivers, restraints and challenges which are expected to shape this market during the forecast period. The increased need for situational awareness is one of the key driver for this market. The Porter’s five forces and the PEST Analysis is covered in this section. Country Analysis: This section covers around 20 countries, the details covered in each of the countries include Country Overview and Military Communication over. The second sub section analyses the spending on communication across three forces of, over the past 5 years. Market Forecast: This section cover the market forecast until 2027, the market forecast section is segmented into 4 which are the Equipment, region wise, by platform and sub-system wise. Events Based Forecast: There are two scenarios which have been analysed, apart from the market forecast covered in the previous section. The main factors which expected to the affect the market have been identified and the dynamics of those factors and its impact on the overall market have been analysed in this section. Company Profiles: The top manufacturers of the military communication equipment market have been identified and a detailed profiling of around 13 players have been covered in this section. Each profiling includes the revenues, recent contracts, strategic alliances, projects completed and SWOT analysis. The report covers all aspects of communication used by Land, Air and Naval forces. Land forces also include the soldier mounted radios. There are three main forms of communication which are the radio, satellite and mobile, out of which mobile telephony is in its introductory phase, SATCOM is in the growth phase and Radio is in its Maturity phase. The market size of application aspects like C4ISR are not covered as a part of this report. The equipment segmentation covered in the report are communication system, radio, phones, multimode radio links, data link systems and others; around 21 country level programs have been covered in detailed. The report features more than 143 tables and 200+ figures.